WOW! 2,000 amazing followers!!! I am thrilled with delight!!! For my fabulous followers- whether you were here from number one, or just joined as number 2000, I am offering this fun hands-on math center for addition to 10 for free! Not a follower- no problem! Download it and if you like the quality of my work, consider becoming a fabulous follower so that you also receive email notification of future product and follower milestone freebies! Print on cardstock and laminate. Can mark the backs of the cards with the number (sum) to make them self-correcting. Students match the family to their house based on sums. Black & White (blank) set can be used for students to make their own house/family for a fun bulletin board to display their understanding of addition! 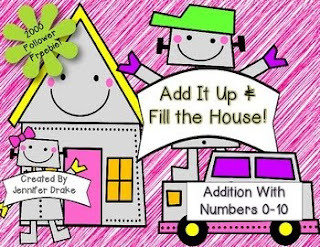 Either assign numbers or let students choose a number to write on the banner under the house and then think of number sentences that have a sum that matches the house. Looking for more addition fun? Visit My TpT Store and click on the custom categories that best match what you are looking for! Come on by and visit my Facebook page and My Blog for exclusive fan freebies, giveaways, games and more! THANK YOU again to my supportive and appreciate followers! Your continued appreciation via feedback left for this freebie is greatly appreciated! Happy Robot Family Addition To 10 Fun!